* Is the conferring of baccalaureate degrees by community colleges a solution to increasing access to and capacity in higher education? * Will the conferring of baccalaureate degrees restrict open access to, and imperil the existing mission of, community colleges? * What are the models and alternative methods of delivery? What are the implications? Breaking away from their traditional mission of conferring only associate degrees and occupational credentials, an increasing number of community colleges have begun seriously to explore and, indeed, in some U.S. states and Canadian provinces, to actually implement offering and conferring bachelor’s degrees. Some leaders see these changes as a natural extension of community colleges’ commitment to access, while others view their awarding of baccalaureate degrees as inappropriate and threatening the basic core values of this unique sector of higher education. This has become a "hot" and controversial topic, not only among community college and university leaders, but also among policy makers, business leaders and students concerned with issues of access, cost and the structure and purposes of post-secondary education. This book analyzes the emerging trend of the community college baccalaureate degree in the United States and Canada in order to contribute to the development of policy. The authors aim to describe, document, and explain this significant development in higher education. They present the background, examples of practice and different models of delivery, develop a common terminology to facilitate discussion, give voice to the views of proponents and critics alike, and include a comprehensive bibliography and set of resources. This book is intended as a catalyst for dialog, action and further research on this critical and emerging trend. It is essential reading for leaders of community colleges, for administrators and planners in higher education concerned with issues of access and articulation, and anyone in public policy grappling with demographic trends and society’s need for educated citizens able to meet the challenges of the future. "…an important contribution to our understanding of what is sure to become a major policy issue….a must read for state policy makers and community college leaders contemplating adding the baccalaureate. Leaders of four-year colleges and universities, particularly in states where the community college baccalaureate is, or is likely to become a reality, will also find this book very helpful." "An important point to make early in this review is that the editors have taken care to present both supporting and opposing views to this trend. 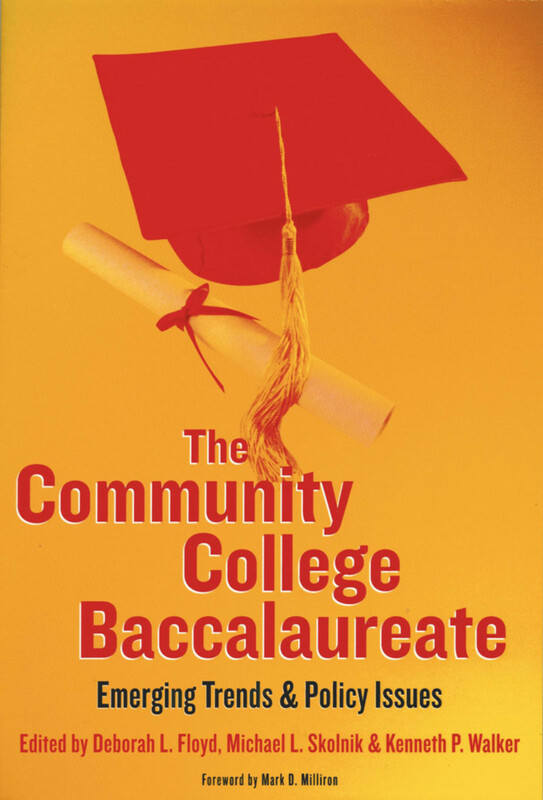 This comprehensive perspective is one of the strengths of this work, as all individuals concerned with the community college baccalaureate can use the book to consider both sides of the issue. In fact, one entire chapter is dedicated to presenting both positive and negative perspectives regarding the community college baccalaureate. A second strength of the book is that each chapter ends with a section of questions or issues for research and policy. One of the final chapters of the book then elaborates on common themes concerning research and policy that emerge in each of these sections....This book is clearly valuable to policy makers, state legislators, faculty in community college or higher education programs and their students, a nd the community college constituencies of trustees, administrators, and faculty....This book…will contribute greatly towards future research and policy decisions regarding the mission and role of the community college." "The book does provide needed advice for schools about what to consider and do before plunging into a new universe. Readers can learn from the authors' own experiences as well as their findings." "[This book's] analysis is quite timely because issues related to the community college baccalaureate are in the forefront, especially in those states with a high population growth rate and relatively low institutional enrollment capacity. A major strength of this book is that it provides balanced coverage of various points of view. Most of its chapters, including the case study chapters, conclude with a list of questions for policy and research. This book should interest plannners on campuses of both community colleges and universities and in state-level offices....Very careful examination is given to the implications of awarding community college baccalaureate degrees for institutions and for entire state higher education systems....Planners will pleased to find that technical questions are also identified. Examples here include fitting community colleges awarding some baccalaureate degrees into national classification schemes, and revising performance measures regarding transfer to make them applicable to community colleges that award some baccalaureate degrees." "How can community colleges best empower students to earn their baccalaureates? By entering and competing in a congested four-year college market? By articulating? By collaborating? Can these schools expand their missions while remaining student-centered? Advocates and critics state their cases in The Community College Baccalaureate; seasoned practitioners then delineate methods of implementation. Here’s a comprehensive, timely book about our open access colleges--where innumerable North American students begin their postsecondary education." "The Community College Baccalaureate not only offers insights on trends and policy issues regarding the baccalaureate degree at community colleges, it also documents its development and ascending prominence in two countries. This is an excellent source book for scholars, practitioners, and policy makers." "Community colleges have become the single most important means for low-income and minority students to attain a baccalaureate degree. Policy makers, scholars, and college leaders have an obligation to work to remove the barriers for all of today's community college students so they can continue their education beyond the associate degree if they desire. The authors discuss several alternatives to promote access to the baccalaureate degree, some of which are controversial, but all of which deserve consideration." "This book is a ‘must read’ for anyone who cares about the future trends of undergraduate education. Community college presidents, board members and others who are considering launching baccalaureate programs should read this book and learn from the journey of others along with the many policy and research issues this movement poses. Legislative, university, and association leaders would benefit from the common terminology framing discussion and posed policy ramifications." 7. St. Petersburg College: Increasing Access in Critical Areas—Thomas E. Furlong, Jr.
13. Community College Baccalaureate: Resources and Information—Michelle Eastham. Deborah L. Floyd is Professor of Higher Education Leadership at Florida Atlantic University in Boca Raton with over 25 years of administrative experience in community colleges as a president, vice president, dean and director. Kenneth P. Walker is the founder of the Community College Baccalaureate Association (CCBA), the Chairman of the CCBA Board of Directors currently the District President of Edison College in Ft. Myers, Florida. He has forty-two years' experience in community college teaching and administrative positions, including thirty years as a college president.